By Dan Ambrose: Trainer Freddie Roach is slowly revealing how unhappy he is with his fighter former WBC middleweight champion Julio Cesar Chavez Jr. with which he went about getting ready for his September 15th title defense against Sergio Martinez. Roach didn’t like how Chavez Jr. blew off training practices, elected to train at home, and he definitely didn’t like how Chavez Jr. failed to follow his instructions in losing his World Boxing Council title to Martinez by a 12 round decision. It did look a lot like Roach was little more than a water and towel boy for Chavez Jr. in between rounds, giving him water, drying him off and giving him advice which he promptly seemed to ignore. At the same time, Chavez Jr. was receiving instructions piped in from his father Julio Cesar Chavez Jr., who was sitting ringside and having his instructions relayed to Chavez Jr. through a courier. That much have been hard for Roach, as well as Chavez Jr. He was hearing two different things from separate people. 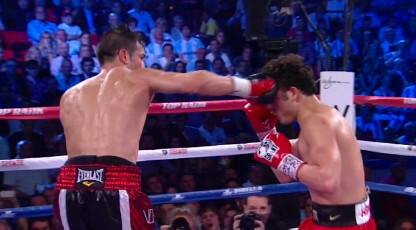 The thing of it is Chavez Jr. appeared to follow neither Roach or Chavez Sr’s advice and just plodded forward all night long, not throwing punches and just looking like he was badly out of his class and intimidated by the moment. If Roach is going to continue to train Chavez Jr, then he’s going to have to get some control over him both in the training camp in during fights, because it makes Roach look bad by having Chavez Jr. doing what he pleases during camp and the fights. Since Roach is considered the captain of the ship, he gets hit with the criticism for Chavez Jr’s poor performance and that puts him in bad position. Roach obviously doesn’t want to see other people lose respect for him as a trainer, so he’s going to have to make a decision for Chavez Jr’s next training camp. If Chavez Jr. continues to do mostly what he wants to do then Roach may need to stop working with him.